Recently someone asked me the age-old therapeutic parenting question: "How do we KNOW they are acting out in shame and fear? How do we actually KNOW they feel that all the time?" I have wondered the same thing. You don't see it, so how do you know? Who is the person who was able to climb into their heads? Where did this whole theory come from???? It came from the children, themselves. Some of them have healed and attached enough to talk openly. Some have grown into adulthood and can now share their stories. We have learned so very much from those who have literally walked in our kids' shoes, but were given the help they needed to find healing ... and can now help. What I found so very interesting about Denise Best was how most of the things in her presentation came directly from the children she treats. She uses their words. She sees these things over and over and over again. And she sees how therapeuitc parenting really does work over and over and over again. Now, in this discussion, I want to share something which was finally explained to me in detail - the difference between shame and guilt. It's like I always knew they were somehow different, but had never known how to distinguish it in words, nor had it been done for me. Guilt says "I feel bad about what I did." Shame says "I am ALL bad because of what I did." After her years and years of experience with kids just like ours, she says, "It is common for children to display a lack of remorse for their behavior, this should not be confused with their level of shame." Daniel Goleman (author of "Emotional Intelligence") is studying the role that shame plays in relationship difficulties and violent behavior - and finding a correlation. I have been getting back into the groove of acknowledging my child's shame - not buying into the miscues. However, earlier today, we were all outside setting fires (we do live in the country - don't freak). This child had a disagreement with a sibling. They weren't necessarily wrong in what they did, but they could have handled it better. No biggie. Yet, when I pointed it out and asked them to fix it, BOOM, the body language shifted, as did the face and voice. Being fresh off the therapeutic parenting conference, I used that as MY red flag to immediately address the feeling behind the action. First, I was standing a good distance away from them. The whole situation probably made my child feel very exposed. I walked closer. "Sweatheart, ya' know, this really isn't that big of a deal. There was just a more productive way to handle it. Not a big deal." Smile. Rub on the back. Play with the hair. "I'm right here." Just a long, very quiet pause. The other two girls had walked off. Finally, I asked, "Are you feeling strong enough to go make it right with your sister?" "Yeahhhhh." "Would you like to do it by yourself, or would you like me to be with you?" Hug and kiss and an "I love being your mom," and they ran off to take care of it on their own. It was actually something as insignificant as wishing they had a walking stick as cool as their sister's. We have millions out here. But that minor altercation combined with a correction which left them feeling very vulnerable. No matter what my voice sounded like, or what my intention was, or how big I was smiling ... my. child. felt. shamed. It's not that they're getting away with anything. They need natural consequences. They need to fix things. But they need us to give them a way to do it which builds them up instead of tearing down what is already flattened. I joke, but I DO! I have caught myself trying to come up with more I can do or say, because my kids don't appear to feel badly enough for what they did. Dr Paul Eckman, from the University of California, says there is no emotion more private than shame. In fact, humans have not developed any facial expression that definitively expresses it. "My name is Christine, and I'm a shamer." I've had all the same questions and concerns that Ursula has. I have worried that by addressing shame and doing a quick "redo" or a "fix" that my kids will blow off the severity of ALL they do, and won't heal and won't change their behavior. I very clearly remember the day I took a deep breath, and thought, "These people who are advising this aren't just pulling it out of their butts. They have healed it. They have walked with families. Some of them have been unattached and/or traumatized themselves. They have seen it with their own eyes, and they know it works, which is why they keep telling more and more people to do it. They're not gluttons for punishment." I had to trust their experience and try it, or say, "Screw it. My kids are somehow magically different." I took a step of faith. It felt horrible. Many days it felt like it wasn't enough. The behaviors actually lessened, but that felt like I wasn't coming down on them hard enough - like I needed to see their misery. Some days it is SO HARD. It is SO BACKWARD. It's not like there aren't consequences, but I WOULD FEEL BETTER IF THEY WERE BIG, FAT CONSEQUENCES BECAUSE SOME DAYS THEIR STUFF IS SO CONSTANT IT IS OUTNUMBERING OXYGEN MOLECULES! I will confess (lots of those today, huh? ), I have a little journal I keep on my computer of things I want to do ... things I want to say ... consequences I want to instill. It helps me. I absolutely have moments where I walk into the bathroom, glare at the mirror and say things like, "You. little. *!%*!&*^%$!" What happens in my bathroom stays in my bathroom. So, I absolutely do believe our kids feel shame and fear a lot. My child is attaching and healing, so theirs is less, but it is still there. They can talk about it now. They can thank me for stopping and looking past the behavior and saying, "I'm right here. This seems to be a tough day for you." They can say THANK YOU! I told my kid about this post, and asked them why I have never (until recently) ever seen any shame in them. "Cause I HIDE IT! Duh!" My child is yet another person who totally knows what they're talking about. Thank you Christine, that helps tons. That makes it understandable. I can totally see it too, the belief in each of my kids that they ARE bad. Heck, I feel the same feeling at times. Totally heard that "Glory!!" and I see that hand, sister! Oh, and in about three days, you will have forgotten everything I've written (cause that's what I do). So, at least we know where to come back and remind ourselves! Hang with it. You're not alone! Been the shamer route. Did it again this morning as you've probably already read this morning. Screaming note to self: IT DOESN'T WORK. Their shame is so huge (albeit mostly unnoticable) that it seems insurmountable. But it is. Adding more shame only exacerbates the problem. I know this and will still try to do it. Ugh. J's shame was huge. She felt so dirty, unwanted and unlovable. Now that she's so much better she can admit to the feeling of shame. Before...never. "But they need us to give them a way to do it which builds them up instead of tearing down what is already flattened." I'm going to glue this to my eyeballs so I can always see it. EXACTLY what I needed to slap me in the face today. THIS is why I love coming here! This definitely helped. Miah verbalizes shame pretty well. Gabe, not so much. So how do you pull them out of the shame? How do you address it without adding to the shame? When there is blatant disrespect, how do you address it without consequences that cause shame? I guess I'm just not getting it. I see it, and sometimes it's easy to address, but other times it takes all I have to not strangle the child, let alone not yell and give punitive consequences. Counseling Thursday. Needing answers. Needing help. But the funniest part (ok, aside from 'stays in the bathroom') is that I grew up jewish and my husband grew up catholic. maybe people say jews and catholics get along well becuase they have guilt in common. I eventually realized that no - jews have guilt and catholics have shame. my husband takes any small notice of something he did wrong as a statement of what a bad person he is. I know i do a lot of things wrong, but it makes me lazy . . .not bad. I so needed to read this post today!! I can identify with everything you wrote. It is so good to know that I am not alone in my feelings and it is also just the wake up call/reminder that I needed. I too would LOVE to be a fly on your wall and just "observe" for the day! Thank you so much for taking the time out of your busy life to share with all of us! I'm glad I have found your blog! I love it so far. My husband the last year works with a young man with RAD plus a few other things. He teaches him independent living etc living at a rental house of ours. Your posts help me understand this young man. He is 21. Your comments remind me of a book on parenting called, "how to make parents mind without losing yours"...to an extent. Lots of reality discipline here. Errrrrrrg. I have this problem with pee. I've spent YEARS trying to convince myself it doesn't bother me and it it so still a hot button. Every time I have to literally stop and rearrange my facial features. I didn't do it fast enough last night (plus it was combined with pretending to not know where the wipes were and pretending to think the container was empty) and, yep, sure enough, shame-based disregulation for the rest of the evening. Grr. I put a HUGE sign over Sissy's bed that said "There are no bad people, only bad choices. Mommy loves you no matter what"
and I make a huge deal about using specific, conditional praises when complimenting ALL of my kids (RADs or not) it's just too hard not to fall into the "im a bad kid" train of thought with or without RADs! I heart you! Thanks for the reminders, the pep talks, and the very human confessions. Question-does hubby change his ways of parenting along with you-I find it hard to be on the same page. I'm the one who attends conferences then relate the info back to him. But he doesn't reallly buy into all the different approaches I bring home. How do you work it out? Oh man, do I ever know that feeling of wanting them to have a big fat consequence for their behaviour. This stuff is just so dang hard. But it really really really works. Our P is getting to the stage where he can tell us about some of his internal make-up now, so I can vouch that there is a ton of shame and fear. And you should see the relief and relaxation that comes over him when my husband and I parent him the right way. It is so noticeable. If only we could get to where we're 100% good at it 100% of the time!!! Thank you a thousand times over for your posts. yep, I can be a shamer too! ( but I try really hard not to) Calvin has a huge shame response and the hardest part of that for us has been trying to get other adults to see what that means for him. Linda, we have lots and lots and lots and LOTS of sit-downs. Sometimes I ugly cry and say, "I know you don't KNOW you're doing it, but you're totally sabotaging what is going on. Whaaaaaaaaaaaa!" Other times I actually speak to him like a real, live grown-up. I do suggest getting video and CDs so you CAN share those learning experiences together. He and I did the Nancy Thomas 8-DVD series together right after the kids came home. Got us off on the right foot. Yet still ... sometimes ... we get disconnected and out comes the ugly cry. I have TOTALLY gone back and forth on the shame business. 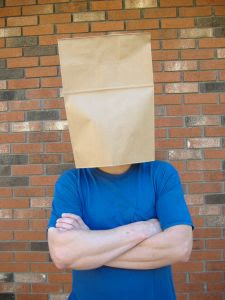 And I have worn the proverbial paper sack on my head as well. I'm so trying to work the positives and be helpful instead of hurtful. It's happening slowly but the progress is definitely there for me(and it feels good). i guess when i said "this stuff is hokey" the other day i meant that it all seems like a bunch a cowpoop...like they--whoever they are--made all this crap up, and they're just soft, and the kids are going to rule the roost and never really learn to be responsible for their actions/words/etc. but maybe they didn't. and it all does seem backward and wrong to me. and i guess that is what is so difficult for me is to abandon my way--which i think is biblical--for someone else's way wthat i cannot figure out if it's biblical or not. i guess i am big on doing things the "right" way...like there's only one right way. i don't have RADical kids, but i do have other issues due to attachment. and it's still hard. and i still don't understand how whispering works cuz it feels like coddling to me cuz i like big consequences. i like to pack a punch--so to speak--so the message is driven home. i'm a hardass.